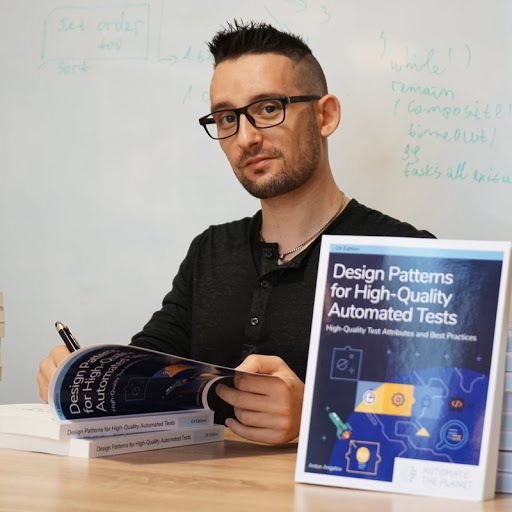 My name is Anton Angelov, co-founder and CTO of Automate The Planet Ltd. With more than seven years of experience in the field of test automation, I help people to write high-quality and maintainable test automation. Passions of mine are automation testing and designing test harness and tools, having the best industry development practices in mind. Furthermore, I am an active blogger and international speaker. Honored to be nominated for best QA in Bulgaria in 2017. Moreover, my articles have been published in international magazines a couple of times. I have more than 8 years in the field of automated testing. For more than 5 years I worked as QA architect in two big companies- Telerik (back then the biggest software company in Bulgaria) and later in US company called Progress (similar in size). Part of my job was to design and write scalable test automation framework that more than 10 teams had to use. In parallel, I consulted a couple of companies regarding test automation and lead several related trainings. Now I own a business building a SaaS test automation framework. How to Test the Test Automation Framework? Nowadays, more and more companies are building test automation frameworks based on WebDriver and Appium for testing their web and mobile projects. A big part of why there are so many flaky tests is that we don't treat our tests as production code. Moreover, we don't treat our framework as a product. In the talk, you will see examples of how you can automate the testing of your test automation framework and be sure that it is highly reliable. You can get lots of ideas for various types of tests such as learning tests verifying that 3rd party dependencies are not breaking the code, compatibility tests checking that the UI components are working for each mobile control on each OS, cross-platform verifications for testing whether everything is working on multiple OS. Sample test environments for storing different distributions of the framework packages will be presented. The need for test automation nowadays is undeniable. For choosing the right solution for our context, we need to know what are our options and fully understand them. We will talk about the five generations of test automation frameworks, what they include, who uses/used them and how they are related to the evolution of the QA profession. The full-stack test automation frameworks are the 5th generation of tools. You will hear why they are different, what they include and why this is important. Understanding the evolution of the automation tooling entirely will help you define better the requirements for your test solution or give you ideas on what to improve in your existing one. As a bonus, you will see demonstrations of sample features of such a framework and get inspired how to build them yourself.